KIAF 2010 : after really claiming international recognition in 2008, the Korea International Art Fair pushes harder into the global stage. Names ? 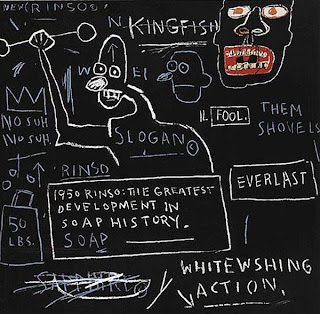 I could mention Damien HIRST because Britannia is ruling this year and this show has a lot to do with hype and money, but since art is involved, I picked this "Untitled" by Jean-Michel BASQUIAT. 2010 Busan Biennale : more compact than the previous edition, this biennale isn't as much a pan-Asian mecca as the PIFF for the movie industry. - what : theme "Living in Evolution", Special Exhibition "Now, Asian Art". Artistic director Azumaya Takashi. 75 artists, 135 works. 8th Gwangju Biennale : A mix of new commissions and older works is supposed to give a temporary museum touch to this emotional edition themed after Ko Un's poem "Maninbo" ("10,000 Lives"), itself a tribute to the 1980 Gwangju uprising. 30 years after the massacre, visitors will meet completely different faces in a completely different environment. - what : theme "10,000 Lives", 134 works stretching over the last century. Curated by young artistic director Massimiliano Gioni.